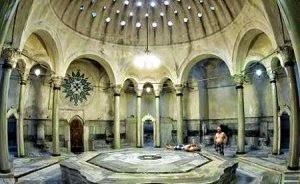 After a few days of hiking through Turkey, I had visions of total relaxation and pampering when I decided to go visit a Turkish bath (also known as a Hamam) in Selcuk. It was our fourth day in Turkey and of our Turkey Active tour and we finally had some time for a bit of luxury. Or so we thought. We entered the Hamam and were greeted by two, big Turkish men who handed us each a thin towel in exchange for 50 lira (this was how much we payed for our experience, and is roughly $25 AUD). We were then gestured to go into one of the change rooms that lined the room. All of us girls (about 7 of us) went into the same one, and nervously wondered if we were supposed to remove all our clothes. We decided to strip down to our swimmers and wrap ourselves in the towels (we guessed everything as no direction was given). We then joined the two Turkish men and the other guys from our group in the main lobby, from there we were led into the bath area. I had done no research about what to expect so was a little awed by the huge room with marble floors and walls, with a big, marble table like slab in the middle. The heat of the room also hit me, reminded me of entering a sauna. I wasn't able to take a picture, but see below for something very similar. Again without much guidance we were directed to the slab and we guessed we supposed to lie on it. So we spread out our towels like it was a day at the beach. Two by two we were called to rinse off in one of the showers that lined the walls and then headed to a one of the two smaller slabs in the back of the room to be "bathed". In the first slab, one of the men thoroughly scrubbed and exfoliated us each. Showing us how much dirt he had scrubbed off our bodies. Given all the hiking and travel we had done- we were all pretty dirty! After the vigorous scrub we were then again directed to rinse off and sit at the second slab. This was definitely where it felt more car wash than luxury, as the man pulled my body up and down (as I was lying down) the slab, slapping my body with a soapy rag. He then flipped me over to do the same with the other side of my body. He ended it by throwing water over me. I was then directed outside where I found the others who had gone before, all wrapped in towels and sipping apple tea. I too was then wrapped up and served tea. As we sipped our tea we all agreed that despite the shock to our system, we had never felt cleaner! Hehe I've been offered that experience but I took a rather strong massage instead. I almost wished that I had done it though as everyone that had loved it! How brilliant is a Turkish bath!! I loved it... except for the cold water bucket! !